For your cat-blogging Friday viewing pleasure, a rare moment of friendship between Wednesday and Mona. aw! how cute and fluffy! they're gorgeous! 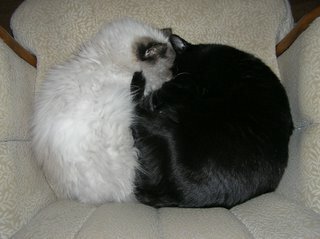 Lovely when they cuddle up like that! And speaking of cute, thanks for your photo card - she's gorgeous, and I love it!